Given that we pretty much cook every day, sometimes, several times a day, the dishes pile up very quickly in our small kitchen. So, we figured it was time to pony up and get some help. It didn’t take long for us to find Dorothy the Dishwasher hanging out on good ol’ Craigslist. She was perfect. She did everything the big girls do, just in a slightly smaller package. She was portable and could double as counter space or be whisked away entirely when company came over. She lived with a small family not too far from us, who were in the process of moving, so we quickly headed over. The family was very nice and threw in a half bottle of detergent to seal the deal. :) The woman remarked that having a dishwasher would “save our relationship.” Hehe. The only problem we had in our relationship up to that point was that was we hadn’t thought far enough ahead as to how to get her home. Although compact, she was quite heavy and would not have fit in the backseat or trunk of the car. It also wouldn’t have worked to rent a truck because we’d still have to somehow get her onto the truck bed. It wasn’t the best solution because the load was a lot heavier than the intended weight for the dolly, but hey, we had to make do. 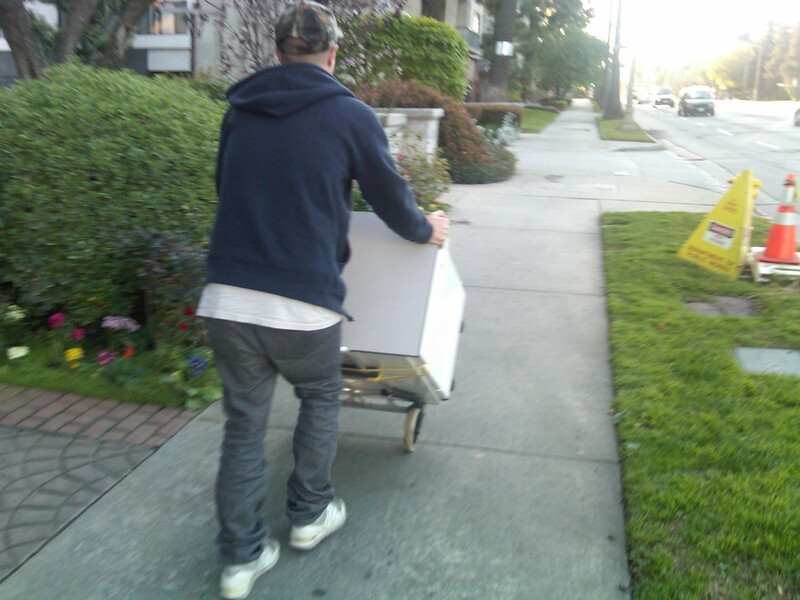 So, there we were, two renters and their precariously packaged dishwasher strolling through the streets of LA. We got many a strange look from the passersby. We even encountered a man whom Husfriend surmised was an aspiring comedian who remarked “Most people walk their dogs!” Chuckle, chuckle. We eventually made it home, dropped Dorothy off and hopped on our bikes to retrieve our car and all was good again.